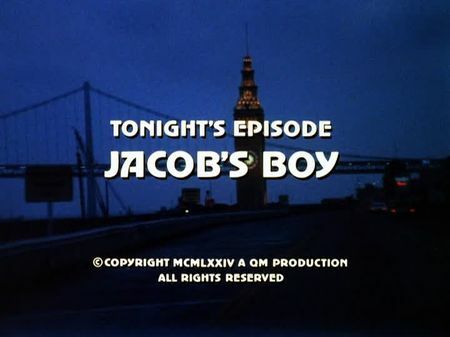 I have just added the screencaps for Jacob's Boy to the episodes' page. Jacob Willis, a sincere man - and more than just a trusted housekeeper for successful businessman, George Todd, and his youthful son, Peter - faces blackmail for an alleged murder of a prison guard on his escape from the work farm where Willis had spent his sentence for steeling a sack of potatoes over two decades ago. When the skid-row bump who blackmailed him, Hoby Shuttleworth, is found dead in a corner at The Embarcadero, and eye-witness (and fellow drinker) Hubert 'Gimp' Franklin points at Willis to be the last one who was seen with Shuttleworth, Stone and Keller need to uncover several facts Willis kept secret in order to forget the painful torture he had to take 25 years ago. After talking to Jacob, however, Mike has doubts that he could be a killer, but then he and Steve find out what the hobo knew about Jacob - and that the guard was actually well alive. Jacob, however, still believes he had killed that guard during the escape, and thinks he must either run away or face imprisonment - a torture he won't take again. His employer's young son trusts Jacob and wants to run away with him, finally leading police on Willis' trail. It's an episode about friendship, a refined man, and prejudices which almost cause the death of an innocent man. In the end, however, Jacob's live is saved and a court hearing finally earns him full rehabilitation. We are offered a nice selection of Bay Area locations of the 1970's. It starts out at the skid-row part of The Embarcadero between Mission St. & The Embarcadero where Jacob meets Hoby Shuttleworth in a bar located in The Audiffred Building. We are then taken to the Marina Yacht Harbor where Jacob prepares the Todd family's boat for the trip they are planning. The mansion that was used as the Todd family's house is of unknown location; it was definitely filmed outside of San Francisco, but the short sequence showing the house makes it a difficult task. In contract, Jacob's apartment was identified to be located in the Western Addition on McAllister. Later on, we go back to the Waterfront where Gimp knocks on Big Frenchy's hotel room door in the 'Corona Hotel' (actually 'The Embarcadero Hotel'), and then both are struggling on Mission St., after Gimp had left "Dori's 21" (located at the corner of Mission & Steuart Sts.). This episode's climax takes us north to Cazadero, where Jacob tries to find a hideout at the Elim Grove Cottages.